AMERIBAG HEALTHY BACK COCOA BROWN NYLON SHOULDER BAG THEIR SMALL 9X17X6"
AmeriBag Messenger Organizer Cross Body Shoulder Bag Leather Nylon Black 13"x12"
Ameri Bag Pink Healthy Back Bag 8X15 NWT! 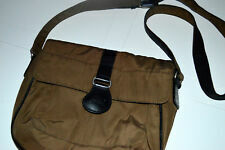 AmeriBag Healthy Back Bag Crossover Shoulder Sling Bag Microfiber Brown EUC! NEW - Tiny Black Nylon AMERIBAG Travel Bag Sling!